A very attractive example of the 1874 U.S. Coast Survey nautical chart or map of the Neuse River, North Carolina. 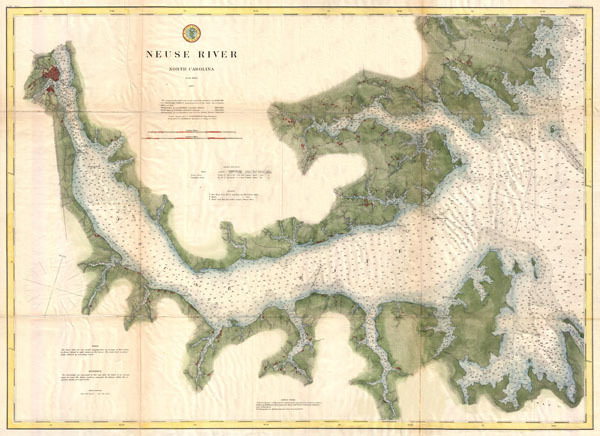 This map covers the Neuse River from New Berne, North Carolina, eastward as far as the river's mouth in the Pamlico Sound. The Neuse River's numerous estuaries are noted as are various hamlets, farms, and triangulation points on the river's banks. Offers exceptional if limited inland detail with important building, streets, and some farms. In both the Pamlico Sound and the Neuse River itself there are countless depth soundings as well as notes on reefs and shoals. This map was surveyed during the tenure of A. D. Bache as Superintendent of the Survey but was produced under the supervision his successor, Benjamin Peirce. Report of the Superintendent of the United States Coast Survey, (Washington) 1874.